On January 21, 2018 at approximately 1:00 AM, the Washington County Sheriff’s Office responded to the 400 block of Bentley Court, Hagerstown, for a report of shots fired. 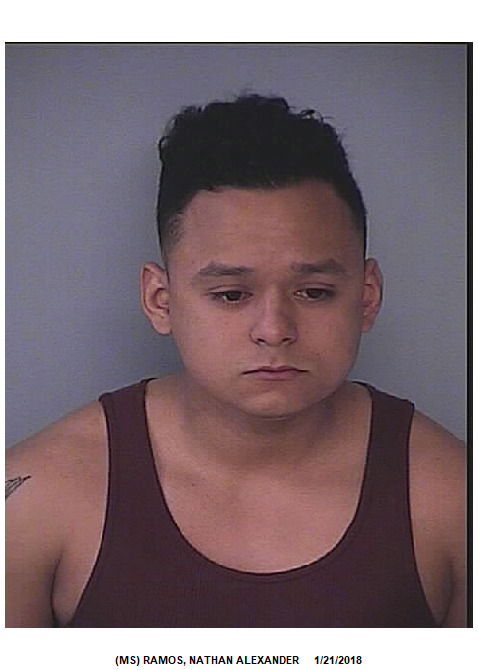 On arrival Deputies made contact with witnesses who advised, a male, identified as Nathan Alexander Ramos, 22, had fired a rifle at the window of his apartment. Witnesses also stated that Ramos was intoxicated and was in possession of more ammunition. Deputies were able to observe a bullet hole in the window of the apartment which Ramos was inside of. The Washington County Special Response Team and Negotiators responded to the scene. At 4:45 AM, Ramos exited the apartment and was taken into custody without further incident. Ramos was transported to Central Booking. A rifle and a spent round was recovered from the apartment. Units with the Maryland State Police and Hagerstown Police Department assisted the Sheriff’s Office during the incident.